Earn 235 - 440 points upon purchasing this product. Use 2350 - 4400 points to purchase this product! If stomach acid levels fall too low this can result in difficulties digesting protein, and may also result in low levels of digestive enzymes and bile being secreted during the digestive process. A supplement containing HCl and pancreatic enzymes may be a very helpful way to support digestion. 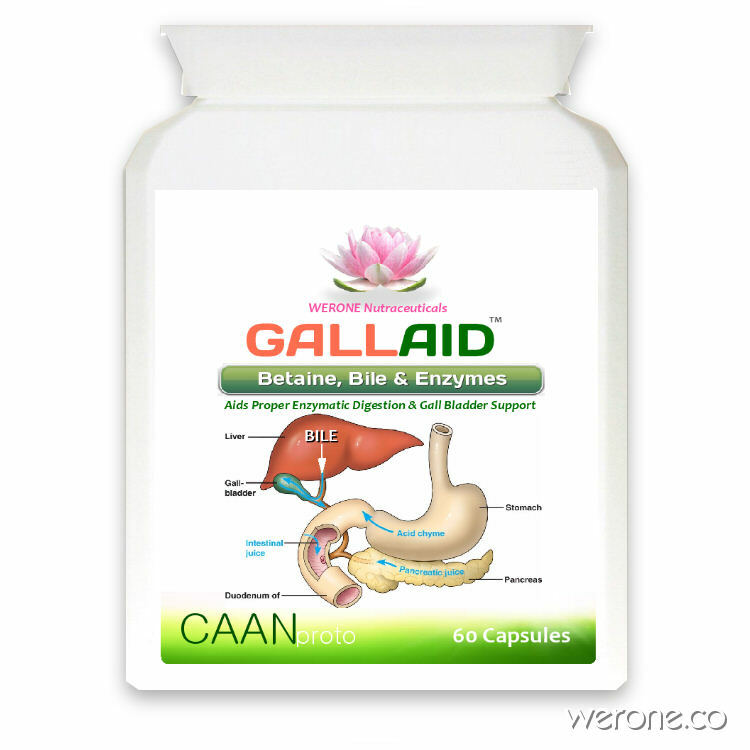 The Gall bladder is one of the most under-appreciated essential organs we have in our bodies. When it’s not working right a whole host of problems occur and our quality of life falls appreciably. Your liver cells make fluid called bile, which is secreted into the bile ducts and then flows to the small intestine. Your gallbladder stores bile; when you eat a meal that contains fat, your gallbladder contracts to release concentrated bile into the small intestine. If your gallbladder is not functioning well, you will not release adequate bile into the gut. If you have lost your gallbladder you will not be able to concentrate or store bile for the extra spurt of bile you need when you have a meal. When there is trouble digesting fatty foods, back pain or nausea, a sluggish gallbladder may be to blame. Recent evidence suggests that inflammation in the gut is closely related to gallbladder function. It is now becoming apparent that gluten may be causing gall bladder problems in the gut–biliary connection and so by removing grains from the diet may alleviate the issues. Bile helps maintain gut barrier function, Like many inter-organ networks, the gut–biliary connection is a two-way street. Leaky gut and microbes entering the blood can lead to gallbladder disease and a backup of bile, but a lack of bile entering the intestine can itself cause leaky gut and an alteration in gut bacteria. What does lack of bile cause? Reduced ability to absorb fat-soluble vitamins – these are vitamin E, vitamin A, vitamin K & vitamin D and they need efficient digestion of fats to be absorbed; thus you can become depleted of these fat-soluble antioxidants. No wonder you will find yourself feeling uncomfortable after eating. You will also find that you have problems controlling your weight even though you are not eating more than normal. You will also have a higher risk of developing a fatty liver. To produce healthy bile you need healthy liver cells and healthy bile ducts. To get the extra spurt of bile you need during a meal you need a gallbladder that is functioning well. Change your diet: many people resolve their gallbladder issues simply by changing their dietary habits. Removing inflammatory foods like gluten, processed foods, and sugar can substantially improve gallbladder health. Stimulate bile flow: bitters like curcumin, dandelion, milk thistle, and ginger are well known for their ability to stimulate bile flow. These can be taken as supplements, included in meals, or consumed as tea. Pour two tablespoons of apple cider vinegar into a small glass of warm water and drink it before your meals. ** Not suitable if you have porcine allergy or have gastritis or stomach ulcer. Suggested Use: Take 1-2 capsules before a meal. Optimal levels are dependent on many variables. For best digestion also pre-ceed a meal with Gall Aid and a Bitter drink such as Digestive Bitters or a diluted tablespoon of Apple cider Vinegar in filtered water 15 mins before a meal and minimise drinking with the meal as this will weaken the digestion. *Betaine Hydrochloride derived from a non-plant source. This product is not diluted with lactose. Individuals with porcine allergies should not take this product. Do not take this product out of the capsule. This product is contraindicated in patients with peptic ulcers. **The Pancreatin in one capsule contains no less than: Amylase 15,750 USP, Units Protease 14,000 USP, Units Lipase 2,450 USP Units. The best Digestive Enzymes… Have been using this supplement for over 10 years. In fact, I’ve been able to go from two per day to one per day! I suspect that my problem (the one relevant to these pills, anyhow) is hypochloridia, possibly brought on by years of taking Prevacid and the like, after repeated (and apparently opposite-from-reality) diagnoses of chronic heartburn being caused by acid reflux. (Even after I stopped taking those, I took Tums pretty frequently for years.) Anyhow, now I’m approaching the problem from a different perspective, and the results are encouraging. I don’t take these if I’m going to have coffee with a meal (ie. breakfast), as the two together make my feel ~really~ acidic, and I generally don’t have symptoms with breakfast anyhow (as I nearly always have a big cup of coffee with breakfast, and lots of liquid after a meal used to be my way to reduce symptoms from lunch, although it wasn’t nearly as successful as these pills). So, between being somewhat careful with my diet, taking lactase pills with dairy, having apple cider vinegar (in water) a few times a day, eating more fermented stuff (pickles, kombucha, kefir, yogurt), taking these pills with lunch/dinner, and the treatment I did for SIBO a month or two back (the Dysbiocide + FC-Cidal pair), I’m getting dangerously close to being symptom free. That’ll be nice, if I reach that point. Really, really nice. Excellent digestive enzymes, as expected from Werone which produces very high quality supplements. I take 1-2 with meals to enhance my absorption of nutrients. I was having digestive issues after my Gailbladder was removed went to a digestive specialist they recommended Prilosec but my nutritionist told me to try Gall formula instead, no more issues!!!! I have tried other digestive enzymes and this helps me the most. Within minutes, I am able to successfully digest fats and proteins and find relief from uncomfortable symptoms. My doctor put me on this product a few months ago for IBS, multiple food intolerances, fibromyalgia and CFS (they all go together with MTHFR mutations, which I have, the compound mutation 677/1298). I had to go off the Gallaid last week for 2 days for a test. I immediately noticed that the ache that I used to have a lot in my left arm and hand, and the stabbing pain in my knee, came back. I know from experience this is because my leaky gut allows undigested proteins to escape into my blood stream where my body attacks them, and it hurts! It is part of the pain of fibromyalgia that is caused by the IBS. As soon as I went back on the Gallaid, that pain stopped. I highly recommend this product, not just for the Betaine HCL, the stomach acid, but also for the digestive enzymes in it. I have taken Betaine HCL by itself, and it did not stop that muscle and joint pain, but the Gallaid does, so it has to be the addition of the digestive enzymes that does the trick.